We start the route from our office in Ciutadella, in the Urbanization Cap de Artrutx. The routes take place on the south coast of Ciutadella and, after a short briefing on the handling and safety of the quad, we start the route to the beautiful cove of Son Xoriguer. This part is ideal to take the first contact with the quad and to solve any doubt. Then we continue the route through the rural area of ​​the south coast of Ciutadella, where through little frequented paths (between forests, farms, farms …) we visit beaches, virgin coves and a beautiful natural pool, so that clients can take photos, rest and take a bath. Then we start the way back to the starting point following various rural roads. The routes last about three hours, and you will discover the beauty of the inland Menorca, the great unknown for tourism. For the routes from the office of Mahón please consult the different routes. The vehicles are automatic, very easy to drive. They are registered, with all the permits and insurance in order. 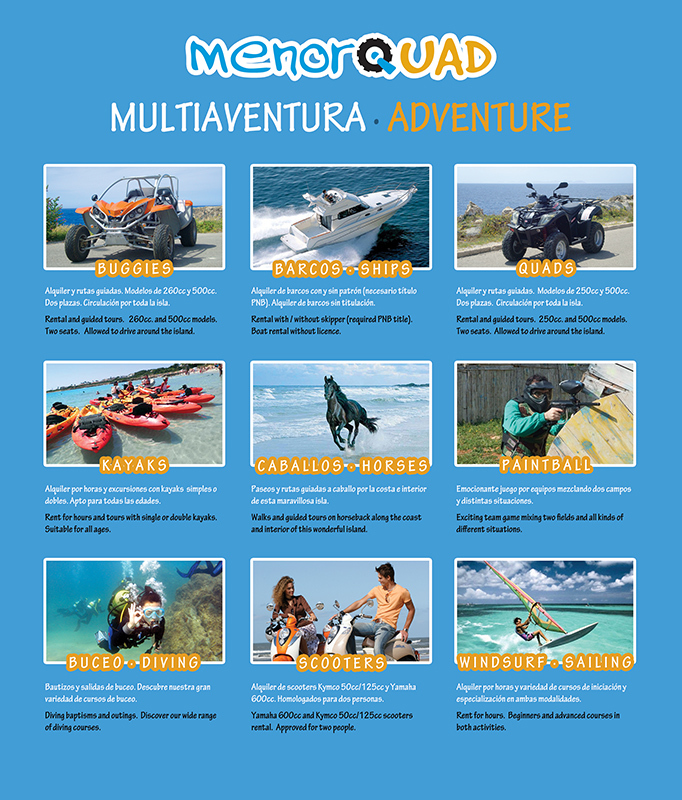 They can circulate freely by the roads and paths of Menorca like any vehicle without any restrictions. All vehicles are approved for two people and have all the security measures required by the authorities. We have bilingual monitors who know perfectly the island of Menorca and watch, at all times, for the security, comfort and satisfaction of the clients turning this activity into a source of fun assured. You only need a valid type B driving license (cars) if you want to have a really good time. The take care of the rest. Leave the car and move at your own pace through the beautiful island of Menorca while discovering its beautiful coves and beaches. Driving such different vehicles through the most varied scenery and paths will be an unforgettable experience. We offer top quality service at the best prices under one fundamental commitment: your happiness is our success. We have a wide range of buggies and quads (250cc.) tested under the toughest conditions, approved for two passengers, automatic and very easy to drive. Our expert team will give you easy explanations for a safe driving. In addition, you can always count on our 24 hours assistance in case of an incident at any place of the island. On our side, we just ask for prudence, respect for the environment and, for drivers, a driving license B (car). Besides, based on our knowledge and experience in the island we will point you on a map the places which suit best to your desires, and any tip or information that you may need. You only have to worry about enjoying the wonderful island of Menorca. We have two routes along the southern coast of Ciutadella via coastal coastal roads, lasting for one or two hours. With a great variety of horses, the client chooses the time and difficulty of the route or ride, always according to his experience in the activity. The monitors have great experience in the realization of this activity and encourage to live the landscape of Menorca in a different way in contact with nature. Of course, the safety of customers is present at all times along with the respect for horses and the environment. The activity of paintball consists in two teams playing against each other with paintball shotguns. The game ends, by marking opponents with paint shoots, when the entire rival team is eliminated. Each team is distinguished by the colour of their kits and vests. Normally there are different sets changing its objectives in various battlefields. The activity takes place in Ciutadella de Menorca in appropriate and safe fields. The customers will enjoy an adrenaline rush as they have lots of fun and action. In order to rent a boat without a skipper, it is necessary to have in force the nautical title of Basic Navigation Pattern at least, or an equivalent title if the customer is a foreigner. The boats measure from 5 meters to 8 meters in length, with powers between 50 Hp and 240 Hp. With gasoline inboard or diesel outboard motors, such as our splendid Faeton 780 Sport 240 Cv diesel with capacity for eight people that stands out for its comfort, versatility and exclusivity as well as for its economy of use. Clients will sail by the Coast of Menorca in case of sea in complete calm. If the wind blows, they must take into account the direction and intensity to choose the route to follow. In any case the company will give the explanations according to the situation. The vessels comply with all security measures required by the Authority. 125cc Scooter rental. Kymco brand with highly proven reliability, simplicity of handling and minimum consumption of gasoline. You can move around the island and walk its coves in a cheap and simple manner. We deliver the motorcycle in our office in Mahon, with delivery at the airport upon request and availability. Helmets and trunk included, homologated for two people. It is necessary to have the driving license type A1 or B1 in force.